Now is still in the Chinese New Year period. Chinese New Year celebration is long, 15 days of celebration, but many people’s Chinese New Year mood has been dropped till 0 percent because everyone has went back to work and school. 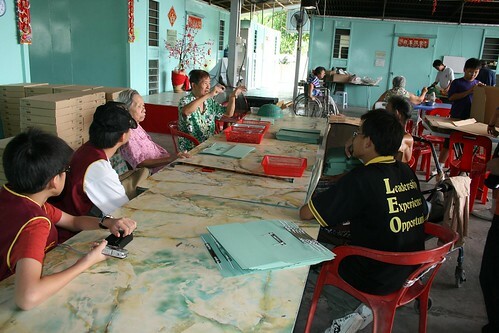 My Leo Club do make a visit to old folks home or orphanage every year during the Chinese New Year. I went with them last weekend. It’s pretty far from my house or school. Relau is like on the far end of the island. We chartered a bus to take us there. Took about 20 minutes to arrive there. I had never been there before, only been to 1 old folks home that is the Little Sisters of Poor which is located behind my school. This is the 2nd one went to. That’s small? No way. According to the man of this home, the in front house is for those old peoples that are sick. Easier for caring and “emergency”. The healthy one stay in the container like room. From what I know, 3 people share a room. Pity them only. 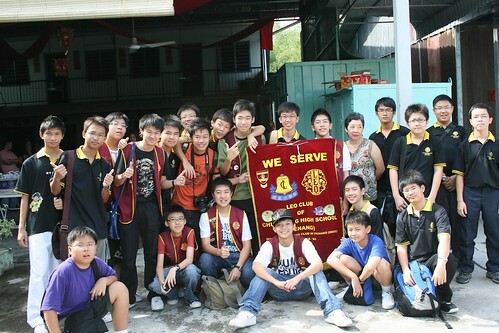 Since it’s Chinese New Year, we were giving donation to the home. I did not pack any ang bao, I’m bad, no. My club teacher advisor did pack a lot for us to give to the oldies. Walking there just to look around is not fun, so I might as well join the ang bao distributing team. Hehe. Uncle was happy when seeing me holding the red envelope in hand. People that no one cares about is real happy when seeing people visits them. Jin Jie gave one to auntie straight away when auntie come out from bath. Haha. We helped out the aunties and uncles to do some work for a while. Then we chat around with them. They were talking history. I realised that most of them is not their children don’t want them, most of them are not married and don’t have child. That’s sad. After listening to some stories, they said living there is like in jail. Can’t go out, the inmate do argue and fight each other some times. No entertainment, sit there, work or see sky whole day. Pity pity. 3 hours at the old folks home and we went home. Of course, we took a group photo before going back as an evidence we went there. LOL. Thanks Allan for holding the camera. wow! really salute of what you guys have been doing for the name of charity. How come they cannot go out geh? no wor, not same club one us. the place got rules one.